Visiting Radio Free Europe / Radio Liberty (RFE/RL) acting president and CEO Kevin Klose met in Moscow at a private party with many of the Radio Liberty Russian Service journalists who were fired by the previous RFE/RL management in September 2012 or resigned in protest. Many of them hope that he will allow them soon to return to Radio Liberty. For the last few months these journalists have called themselves Radio Liberty in Exile and launched Novaya Svoboda (New Liberty) news website, while the official Radio Liberty has been boycotted by pro-democracy Russians and lost much of its previous reputation and audience. Radio Liberty Russian Service director for the last seven months Masha Gessen had resigned on April 30. Gessen said that she was going to write a book about the Boston bombings suspects who have family roots in Chechnya in the Russian Federation. The firings and most of the resignations of the old Radio Liberty team in Moscow occurred before Masha Gessen took over her job and brought with her about a dozen of her associates. Most of her associates have now also resigned. 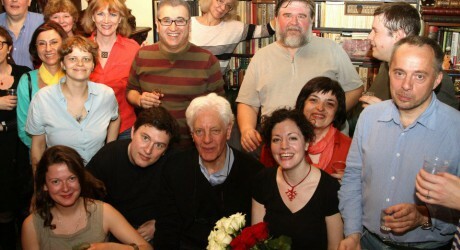 RFE RL acting president Kevin Klose at a party in Moscow with Radio Liberty's fired journalists. Photo by Ivan Trefilov. The party in Moscow was also attended by famous Russian human rights activist and this year’s Nobel Peace prize nominee Lyudmila Alexeeva who has been one of the fired journalists’ strongest supporters. RFE RL acting president Kevin Klose greets Lyudmila Alexeeva at a party in Moscow. Photo by Ivan Trefilov. Two members of the Broadcasting Board of Governors (BBG), Susan McCue, the chair of the RFE/RL corporate board, and Michael Meehan, are arriving in Moscow Friday for a short visit to assess reforms and other changes at Radio Liberty initiated by Kevin Klose. They are expected to meet with U.S. Embassy officials, Russian human rights leaders, independent journalists, and members of the former Radio Liberty team. McCue and Meehan are believed to be strongly supportive of Klose’s reforms and want to see the fired journalists to be able again to contribute to Radio Liberty’s media freedom role in Russia. McCue, Meehan and another BBG member, RFE/RL corporate board vice-chair Victor Ashe, were instrumental in hiring Kevin Klose to reform the U.S. taxpayer-supported media institution. He replaced former RFE/RL president Steven Korn who had hired Masha Gessen and dismissed dozens of journalists in Moscow. Security guards prevented them from saying good bye to their audience of many years. Korn said that journalists had all resigned voluntarily and were treated with respect. Gessen, who had worked for Korn as a private management consultant before being hired, said that she had nothing to do with the dismissals. Leading figures of the democratic opposition movement in Russia, including Lyudmila Alexeeva, did not believe claims of former RFE/RL managers and wrote protest letters to the U.S. administration and Congress. Their appeals have been heard. Failed by their own executive staff who failed to alert them to the developing journalistic and public diplomacy crisis, BBG members took matters into their own hands. The appointment of Kevin Klose has started the process of reform. Most of the RFE/RL executives responsible for the firings and programming changes have resigned. Many of the talented and brave journalists, who have been so badly treated and left to fend for themselves in Putin’s Russia, may soon return to their beloved station to resume their work for media freedom. There is much hope for better days for Radio Liberty and for its audience.